We continue our weekly look at Action Lab’s first-ever companywide event — Actionverse! Action Lab is celebrating its first five years as a creator-owned label with a wide-ranging adventure that brings together its mainstay titles, such as Jamal Igle’s Molly Danger; Vito Delsante and Sean Izaakse’s Stray; and Anthony Ruttgaizer’s F1rst Hero. Every Thursday through the Actionverse event, Vito is talking with his fellow creators about the issue that just wrapped — with an eye toward what’s to come — in ACTIONVERSE AFTERMATH. For ACTIONVERSE AFTERMATH #1, featuring writer Anthony Ruttgaizer and the F1rst Hero, click here. 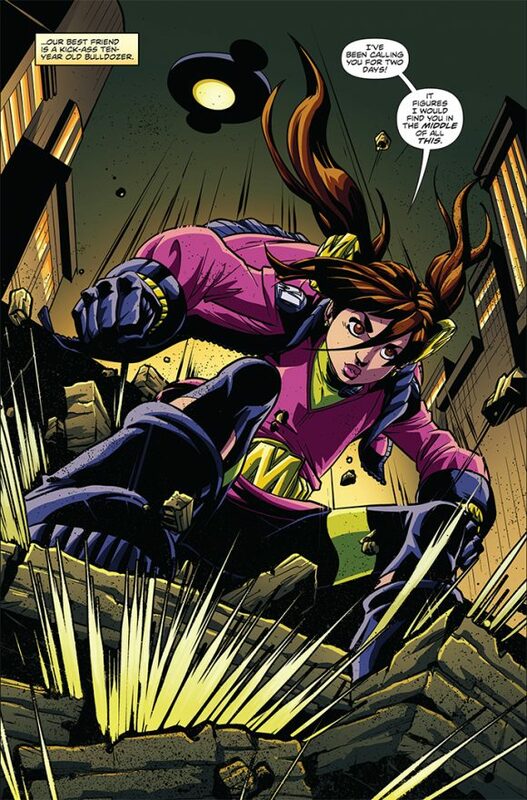 For ACTIONVERSE AFTERMATH #2, featuring writer/artist Jamal Igle and Molly Danger, click here. For ACTIONVERSE AFTERMATH #3, featuring writer Shawn Gabborin, artist Chad Cicconi and Fracture, click here. It would not be a stretch of the imagination to call Ray-Anthony Height “the father of the Actionverse.” Truth be told, sure there are a lot of “fathers” to this project (one could make the case for Shawn Gabborin and Chad Cicconi), but as a concept, the Actionverse began with a Skype conversation between Ray, Sean Izaakse and me. From there, it grew into what you’re reading now. So, how did Ray approach the opening chapter of Act Two? Vito Delsante: OK, seriously. What were we thinking when we, at SDCC 2014, basically created the Actionverse on stage during the Action Lab panel? Ray-Anthony Height: It’s funny. It felt more like letting the general public know what we were already discussing than anything else. Vito: I asked Jamal (Igle) this question, and I feel like you should answer it too. Before his appearance last week, we last saw Gavin (aka Midnight Tiger) taking a selfie with Molly Danger and Stray (in Actionverse #0). Given that the events in that issue took place a little bit before this one, what can you tell us about “where” Gavin was before we saw him on Page 22 of Issue 3? Ray: Because Rodney was with him, I’m going to assume they were discussing the events with Hyena with the Icons at some point and then saw what was going on in the Bay and responded. Ray: Nope. Not a coincidence at all. Rodney and Gavin now share a common foe in Hyena and both guys are pretty smart. Utilizing the background files Gavin inherited from his predecessor Lionsblood, I know Rodney wanted to gather as much info on this guy as he could. Vito: In my head, Rodney and Gavin have ties beyond Actionverse, and like you, I kind of see them as taking that “off-panel” time to dig into that. There’s an ease to their friendship, in writing them, that makes their relationship…easy. So, I guess my question is…what do you see as the cornerstone of their friendship? Because I see a lot of us in them. Ray: Mutual respect. I believe that is the cornerstone of their friendship. Neither is trying to change the other because they know they both have love for the job they do and have the tools to do it. Gavin isn’t trying to tell Rodney how to save Kappa City and nor is Rodney looking over Gavin’s shoulder in Apollo Bay critiquing his every move. They respect each other’s differences while embracing each other’s strength. Vito: Now, in a weird way, the way Midnight Tiger #2 ends, I can, as fan and continuity slave, see Actionverse #0 fitting in between MT #2 and #3. Which would (or rather, could) mean that Midnight Tiger #’s 3 and 4 take place after 0, but before AV #1. I know all your Tiger fans out there are anxiously awaiting #3, and I know that the issue is pretty much finished, art wise (and you’ve gone on record answering why #3 is late on your own blog/Facebook page). Seeing as how these things have happened/are happening, when we get back to Issue #3, will we see any of the events of Actionverse affect the continuity there? Ray: Midnight Tiger #3 and #4 do indeed take place before Actionverse #1 and the epilogue is right before Actionverse #0. The conclusion of Actionverse will make Gavin (and the Icons for that matter) reassess how vulnerable Apollo Bay is. This will push him in a direction towards events that will make him shape his true destiny. He’s in store for a pretty crazy adventure after the dust settles from Actionverse. Vito: I feel like I have a handle on Gavin and his world, having written his adventures three times now. Does it feel weird to see him moving forward, in a sense, without you steering the ship? And it should be stated for the record that Ray was NOT uninvolved in my three visits to Apollo Bay. Ray: You know, I wouldn’t say weird at all. As much as Actionverse was a joint venture…and a fun one at that…it was mostly an adventure unto itself, but with a purpose. To show that we have a shared universe and we did a great job. Without you at the helm, I really don’t think it would have been possible. So, I was more than happy to have you do what you needed with Gavin to flesh out the story of Actionverse. You really handled him well! With that being said, I am so thrilled to be doing it all myself again! I’ve been lucky enough to have had very talented writers like you and DeWayne Feenstra jump on to help me out on scripts to alleviate some of my responsibilities as a creator, but the plots have always been there. Now, as I adopt the Marvel style of script, it makes tediousness of scriptwriting doable for me. Vito: Speaking of Apollo Bay, with the exception of meeting Infernus in Issue #1 and Mister Macabre in STRAY #3, Actionverse was our first true introduction of the Guild of Pain. Granted, they got trounced, but I suspect they’ll be back with a score to settle. Would you agree? Ray: Ha! Well, I’ll be honest. The Guild was introduced way too early for my taste and forced me to work out something pretty cool to explain that when the new series starts up. So, they will indeed be seen again. However, they did serve as a nice way to show off just how powerful Virtue is…..or did they?!? On another note, Mister Macabre in Stray was perfect. He is a loner by nature and …without giving too much away…has been active on his own without the Guild. 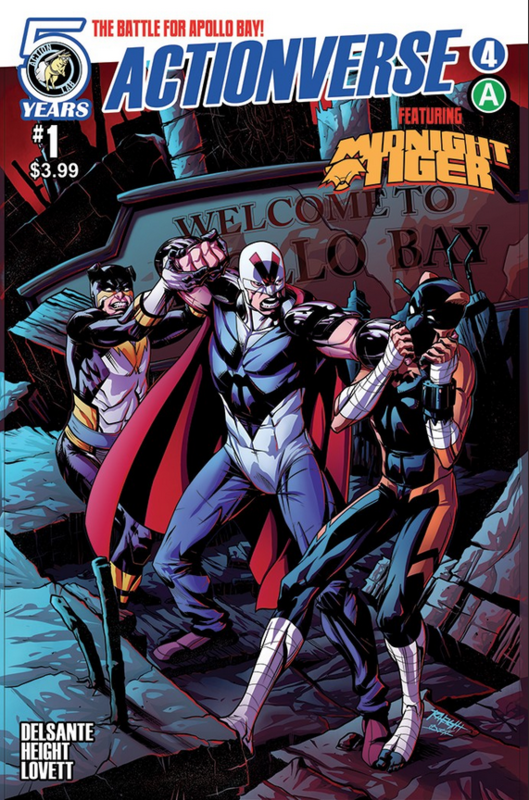 Vito: What is the future of Midnight Tiger, the title, as it stands, post-Actionverse? Ray: As a title, the completion of the mini-series by year’s end (I hope) and the launch of the new series shortly after. As a character, Gavin will deal with the aftermath of what happens in Actionverse as only a Shonen manga/anime hero would. That’s right! Midnight Tiger was always supposed to have a Shonen manga/anime tone to it. Despite my roots being in American comics, my sense of fun and the stories I like to tell have a huge manga/anime heart and feel to them and Gavin is my Shonen hero. The new series will show so much more of that and may…at times…dip appropriately into Seinen material. Vito: When we sat down to work on the Midnight Tiger issue of AV, we kind of worked very freeform, and in the writing of it, it almost became a Molly Danger issue, rather than a Midnight Tiger issue. Anything you wish we would have done with Gavin? Ray: Actually, I don’t think I do. I think it was one of my favorite comic issues to work on and it served the Actionverse extremely well! There was a point to be made with that issue and I think we made it, and then some. 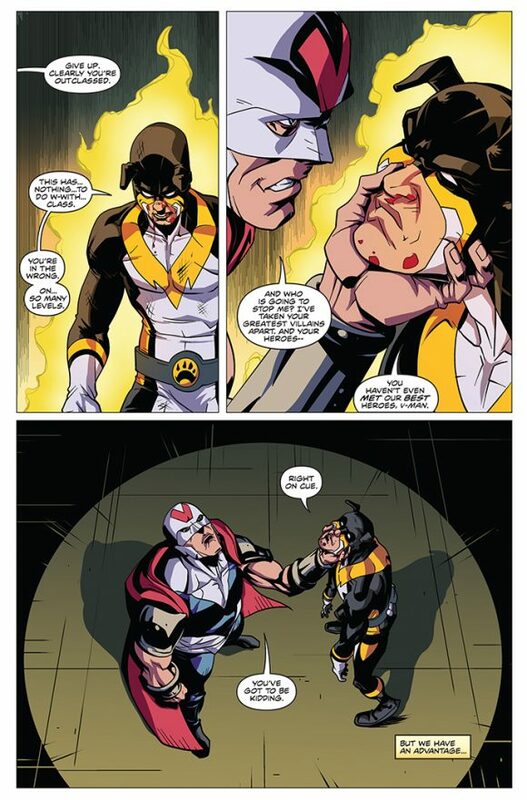 NEXT WEEK: Actionverse #5 … with Vito’s own Stray.